It's The Internets 25th Anniversary How Did We Live Without It? It’s The Internets 25th Anniversary How Did We Live Without It? I was a BBS SysOp (bulletin board system operator) at the time having put my 1st board online with an old IBM 286/12 clone computer and a 2400 baud modem. And i never imagined i would be able to do the things online as we do them today using the internet. While it has been 25 years that the Internet and World Wide Web was introduced, most of us didn’t get access to it until later. I remember getting a dual channel ISDN connection from our local telephone company back in 1996 i believe it was. At that time you had to connect to a service that provided www content. AOL was a bulletin board system that first offered internet connection. A member would dial up an AOL POP number (point of presence) and connect to them to get the latest news, sports, weather, etc. I used a Dynamic DNS service that gave me a sub domain.docsplace.tzo.com not that service provider but something similar that was being run out of some university as an experiment so students could dial into their computers or FTP (file transfer protocol) at home and elsewhere. 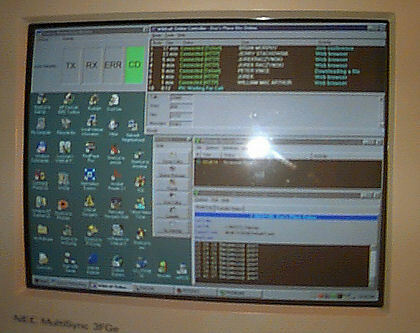 I had 2 dial up nodes on the BBS at that time and was able to dial into my system from work with it’s GUI (graphical user interface) the Wildcat Navigator. With this setup i could use my BBS’s ISDN connection to surf the web using the navigator and Netscape Navigator. Anyone remember Netscape Navigator? I had given the BBS sub domain out to a few friends that had internet access at work and they were able to connect to the board and leave messages and download / upload files. At that time QWK was a popular BBS feature. QWK allowed a BBS user to download a compressed message packet, read the messages offline and reply. The user then connected to the BBS again and uploaded his REP packet. The system would process the messages called Echomail back then, and then dial up other systems that subscribed to the conference areas and drop off and pick up any awaiting mail packets. This is how we communicated before the internet became mainstream. I soon found a local ISP that would give me a dedicated line to camp out on for $100 month. But before committing another Sysop was an administrator at a local church that had an internet BBS and let me camp out on one of the churches dial up ISDN lines. Then Verizon came out with ASDL internet service for 19.95 month and they didn’t care about hobbyists running BBS’s and running other services online. From then access got faster. Road Runner was offering blazing fast Cable Internet service. Then there was Verizon FIOS that was smoking fast! My old BBS is still online today though the dial up lines have been gone since around late 1998. You can visit it HERE if you want. Use the Login and Password GUEST to take a look around without registering an account. The BBS Message bases are still used today. 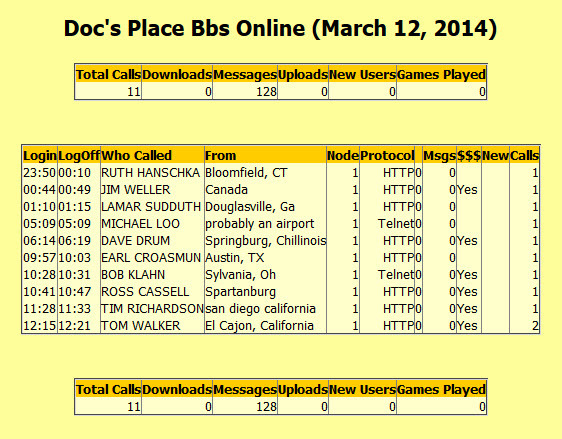 To see who called Doc’s Place BBS Today click here and yesterdays callers are here. Last month i wrote this post: When Fidonet And BBS Sysops Ruled The World. If you enjoyed this article the link above is worth checking out. I can’t help but reminisce about the good old days online. But i LOVE The Internet! Happy Birthday to the WWW!